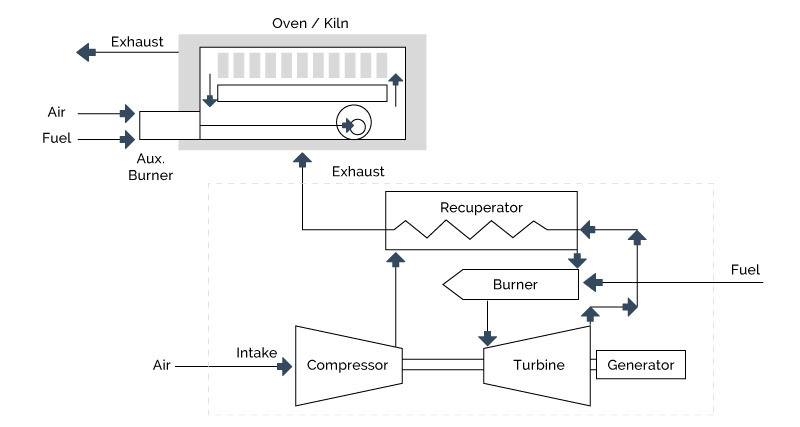 Direct heating and drying refers to combustion products mixing directly with the process environment (typically process solids and a forced “air” stream). Because radiation transfer is rapid, typically at high temperature, and ceases upon reaching a boundary (the outer layer of process matter), it is often undesirable and unnecessary. Heat the dryer feed to the “light” component’s vaporization temperature. Vaporize and/or free the liquid/byproducts above the solids’ surface. Heat the solids to the final desired temperature, and for the desired duration of time. Heat the vapor to the final desired temperature. This is shown in schematic in Figure 5-5. Bringing variable water-weight percent feeds to a desired initial processing concentration. Mined raw materials and/or prepared mixes fed to cement, gypsum, ceramics, and lime processes require crushing, sizing, and drying. Rotary dryers, impact dryers, drum dryers, and others are used to handle large volume, variable composition slurries. Water removal to homogenize process streams for inorganic chemicals manufacture is also common. More complete drying of slurries containing finer solids within certain size/weight specifications is carried out using spray dryers, thin- film dryers, and drum dryers. cracking catalysts and ceramics that may also use this step to introduce property enriching additives/binders to the material. Emulsion PVC and PVP polymer processes often employ spray drying to rapidly remove water without degrading product. Organic and inorganic dry soaps, detergents, dyes and pigments. Metals fabrication and/or scrap metal industries use direct heat to remove volatile impurities (oils, plastics, paints, etc.) and/or to reduce energy demand of central furnace operations. Large kilns, calciners, and ovens (primarily in SIC 32) also benefit from preheated feeds, often containing preheat sections as part of the primary unit (tunnel kilns, etc.). Coke processes may preheat coal feeds to reduce moisture content. Glass and mineral wool indus tries utilize many preheat techniques to reduce energy demands or increase throughput on central furnaces systems. Drying and heating meant to relieve chemically bound light components and/or otherwise modify solid structure. others are included in this grouping. Kilns and ovens used for bricks, ceramics, etc. where residence times in hot and dry conditions may last hours to days to obtain desired final qualities in appearance and structure. Kilns and calciners used to produce/process gypsum, plasters, cements, limestone, etc. where energy not only thoroughly removes any remaining water, but also frees intimate impurities, and forces various reactions often resulting in the release of carbon and sulfur oxides. Along with those operations in SIC 32, both the pulp & paper and beet sugar industries use these lime kiln technologies. Drying to remove water (and/or other solvents/chemicals) added, left, or produced during processing. Starch, stalk and husk dryers, and fruit peel and feed dryers, used in beet and cane sugar manufacturing, grain mill products, and other SIC 20 manufacturing sectors. Convection dryers in textile manufacturing. Veneer and other lumber/wood-furniture dryers. Pulp dryers, coated and tissue paper dryers in SIC 26. Dryers including conveyor and tray dryers used in non & cellulosic fibers (rayon, acrylics, etc.) processing, polymer rubbers manufacture, for pharmaceuticals, and latex.